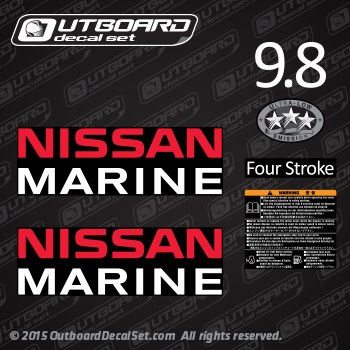 Decal for Nissan Marine outboards from 2006, 2007, 2008, 2009, 2010, 2011, 2012, 2013 and 2014 outboard motors. Nissan Outboard decal set for 2006, 2007, 2008, 2009, 2010, 2011, 2012, 2013 and 2014 nissan engines 9.8 horsepower. This same set of decals may work also for other motor covers from this generation.